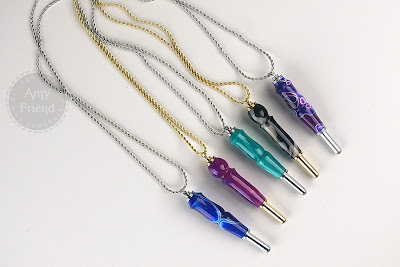 Blog New Product-Seam Ripper Necklaces! My husband has been busy in his workshop. Awhile ago, I promised a new seam ripper design. Here it is! We are now offering seam rippers on 36″ chains. 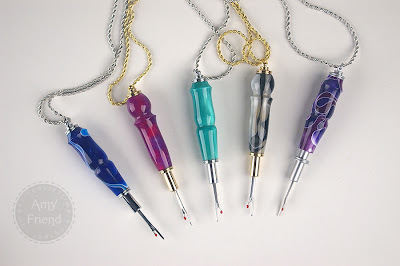 This is the perfect solution for those of you who lose your seam rippers while sewing. I know I do that all that time. The seam rippers are offered in chrome, satin chrome and 24kt gold finish. And he is turning two different profiles for the handles. This picture shows the seam ripper open and ready to use. Here you can see how the seam ripper can easily detach from the necklace and reattach thanks to a super strong earth magnet. And here is the closed position (the one I recommend while the seam ripper is not in use since we don’t want anyone getting injured!). The seam ripper blades are made of durable maganese steel. I have just listed these seam rippers in my shop. There are also two of the regular, non necklace variety, in stock.